Slides of the Official Presentation at CILC 2010, Rende, July 7th 2010. Italian news: Comunicato stampa, (articoletto su Il Gazzettino) e presentazione a Udine del 24/11/2010. 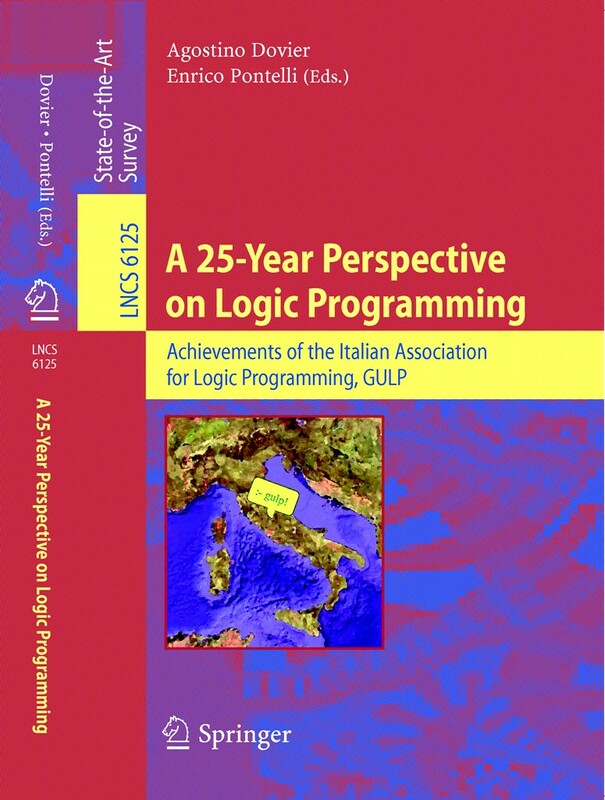 An official review: "Chapters reviews a logic programming (LP) topic of current interest, and the progress made during the last 25 years, with special attention given to the accomplishments of Italian researchers ... Each chapter offers directions for future research in the given area. The chapters are well written, and the uniform style is unusual for a book of this kind. This book should be of interest to seasoned researchers as well as novices. ... list of references at the end of each chapter should be especially helpful. (D. Bollman, ACM Computing Reviews, April, 2011)"
Preface (by A. Dovier and E. Pontelli). Foreword and preface are available here thanks to the courtesy of Springer-Verlag. Chapter 2. Annalisa Bossi and Maria Chiara Meo. Chapter 3. Andrea Formisano and E.G. Omodeo. Chapter 4. Marco Gavanelli and Francesca Rossi. Chapter 5. Laura Giordano and Francesca Toni. Chapter 6. Alberto Pettorossi and Maurizio Proietti and Valerio Senni. Chapter 7. Giorgio Delzanno and Roberto Giacobazzi and Francesco Ranzato. Chapter 8. Piero Bonatti and Francesco Calimeri and Nicola Leone and Francesco Ricca.